If you have been diagnosed with cancer and need financial assistance with your co-payments for surgery, chemotherapy or radiation treatments, there are three factors that will determine your eligibility and how much assistance we will provide. These factors are as follows: your household income, your health insurance, and how much funding is available for your cancer type. Your household income must be equal to or less than three (3) times the federal poverty level to qualify. 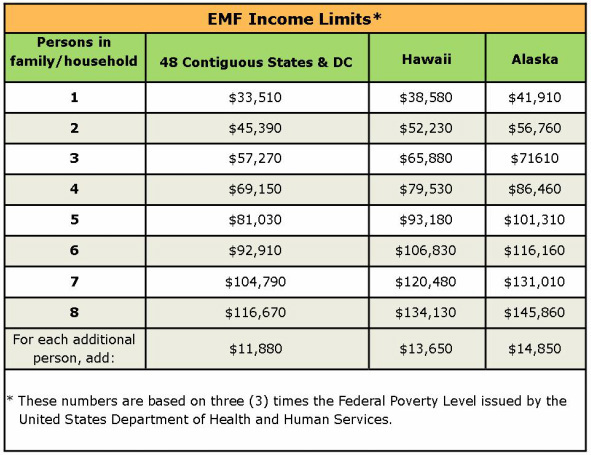 The following chart breaks down the 2012 household income limits. 6) There must be funding available for your cancer type. Call us at 703-901-7666 so that we can verify eligibility and begin the application process. * Your surgery, chemotherapy treatments, and/or radiation treatments must be carried out within the United States. All chemotherapy drugs must be FDA approved for your cancer type. If you are uninsured and do not have any health insurance or medical plan that covers chemotherapy drugs, radiation treatments, or surgery for cancer, then you are not eligible to receive financial assistance from EMF. There must be funding available in the General Fund to be eligible for financial assistance. Please check here for available funding. Please call 703-901-7666 to verify eligibility and begin the application process.